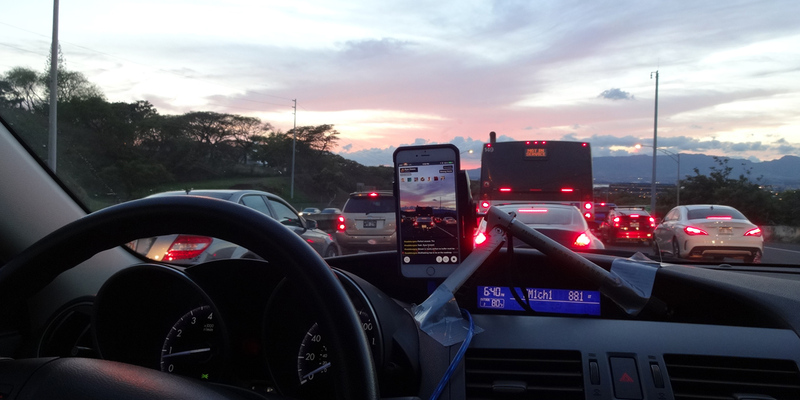 Yesterday, I streamed live video of my drive home from work while a dozen or so people watched. It was pretty mundane, while at the same time, pretty remarkable. I was checking out a new app for iOS called Meerkat, which marries the wide potential of livestreaming with the instant and social strengths of Twitter. Two great tastes that go so well together, TechCrunch described the app as “the livestreaming app Twitter should have built.” With one tap, you can launch a video stream, people can comment on the stream, and you can respond live. Imagine the applications for breaking news. 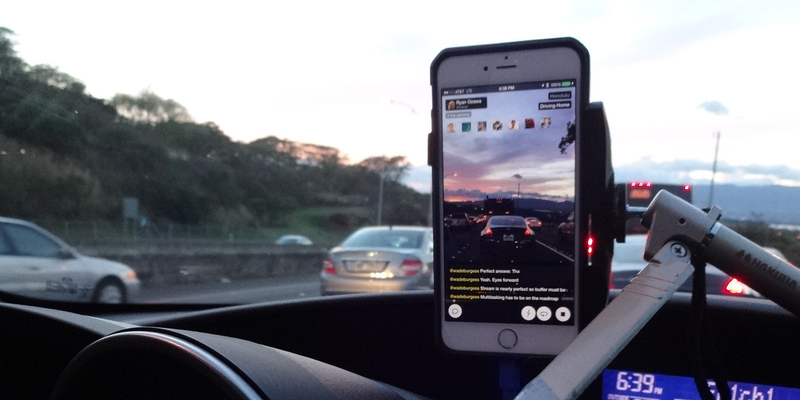 Imagine deploying Meerkat at an event, with broadcasters and viewers easily interacting throughout. I could easily see myself falling head over heels in love with Meerkat… because I’ve been here before. 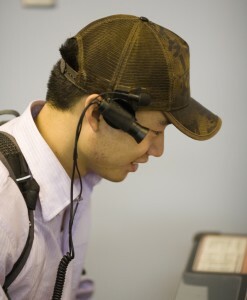 Seven years ago, a 24-year-old San Francisco entrepreneur named Justin Kan launched Justin.TV, a 24-hour “lifecast” of his life captured from a camera strapped to his head. 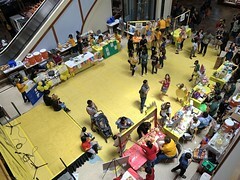 It was a publicity stunt, certainly, and the dull-to-drama ratio was unsurprisingly high. But it was also strangely compelling. Justin.TV was often described as a real-life “Truman Show” — and I was hooked. Perhaps it’s not surprising, since I started oversharing on the Internet almost as soon as I got my hands on the tools to publish online. But I was suddenly obsessed with streaming live video over the internet. And I was interested in more than broadcasting from a studio or a desk — I wanted to livestream from anywhere, too. Suffice it to say, I fell deep down the rabbit hole (and reading that blog post today, it’s pretty clear that I’d lost my mind). I put together my own lifecasting rig — first a MacBook and a FireWire iSight camera, and then a dedicated Windows laptop (which I hacked to run while closed), a massive external battery, a USB modem (with EVDO mobile data service), and a small Logitech camera, all loaded into a heavy backpack that didn’t carry much else. I found a kindred spirit in (of course) Burt Lum, with whom I’ve shared tech obsessions for over two decades now. We both started livestreaming around town, from geek lunches to community events. 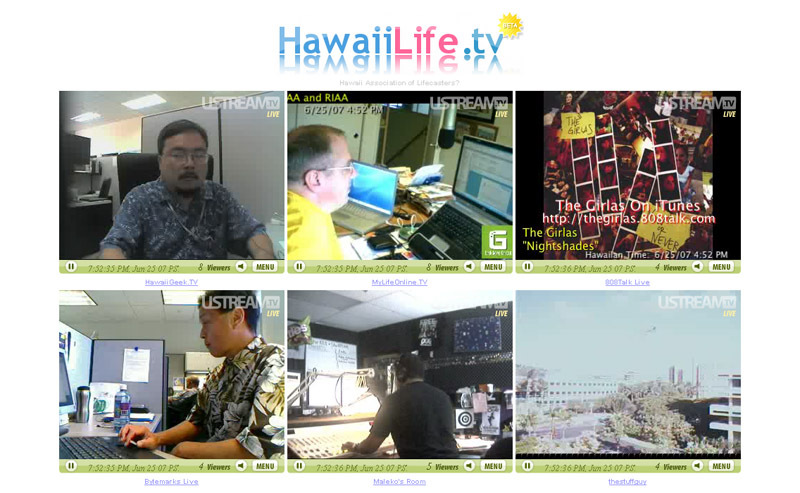 And thanks to Ustream, many others were experimenting with live video. 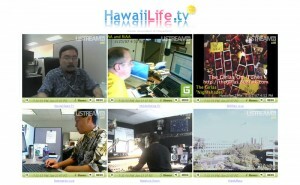 I built HawaiiLife.TV (long gone), a website that embedded the livestreams of several local broadcasters on one page. It was a crazy experiment. 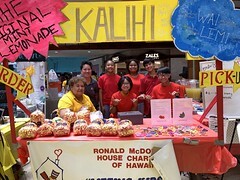 We mustered up coverage in The Honolulu Advertiser, on KITV, and even on Hawaii Public Radio (on ThinkTech Hawaii, the show whose timeslot we would inherit the very next year). The questions we got were the same ones Burt asked me when he first wrote about my online journal in 1994: Why would you do this? And who in the world would be interested in it? But there was something there. We rarely drew more than a handful of viewers at a time, but those small connections were powerful. I was hanging out in the park with my family, while people on the mainland or even overseas watched, sometimes commenting, but often just soaking in the grainy, jerky, postcard sized view. I’ll concede the technology was more boring than interesting in my hands. But I could easily imagine what lifecasting could be like with the right talent, the right personality. But to do it took too much hardware, involved too many moving pieces, and basically too much work except for the most committed or well-funded broadcaster. It’s a lot easier to livestream today. Laptops have cameras built in, and can even have built in data connections. Services like Ustream and Bambuser and Livestream are still around (the latter even announcing new hardware this week). And yes, many startups and apps have come and gone. The one that got the closest to a solid mix of simplicity and social links was Qik… which was snapped up by Skype, which was snapped up by Microsoft. 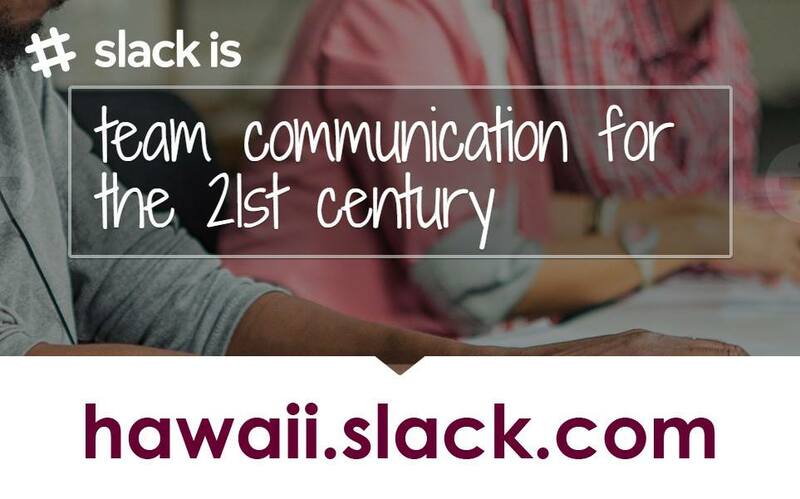 Suffice it to say, the cool version of Qik is no more. Meanwhile, Twitter is working hard to stay relevant. Already the platform of choice for breaking news, Twitter has enhanced its photo sharing options (to rely less on third-party services) and is now in the middle of adding video support. Enter Meerkat, launched quietly on Friday but taking off in a big way with early adopters over the weekend. 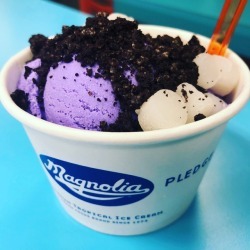 I was on board immediately. Launching a live stream is as simple as sending a tweet… which Meerkat does for you when you start broadcasting. Your followers can quickly click over to watch. And they can comment on what they’re seeing (which is also tweeted as a reply to you). And you can see what people are saying right on your screen, and respond. You can schedule a future livestream, but I couldn’t figure out how to pick up a placeholder broadcast rather than starting a new one. Since it’s the most complicated part of the app, and since the instant aspect is the best part of the app, I could easily see the “schedule” button being ignored and eventually disappearing. The only other buttons are “like,” of course, and “retweet,” which basically allows your followers to invite their followers to join the livestream. Basing the app on the Twitter social graph is genius. Twitter is obviously not for everyone, but people who move at the speed of Twitter are perfect for Meerkat. Whether it’s sharing a random thought from a bank line or reporting from the front lines of a natural disaster, you can now go live just as easily as you can type a 140-character update. Actually, going live is easier. This simplicity is a big part of Meerkat’s charm. So far on the app, I’ve watched marketing guru Gary Vee answer viewer questions, I’ve watched fellow long-time vlogger Steve Garfield shovel snow in front of his house, and I’ve watched tech reporter Sarah Lane working at a standing desk. While she worked on a segment about Meerkat. Which Drew Olanoff was broadcasting on Meerkat. 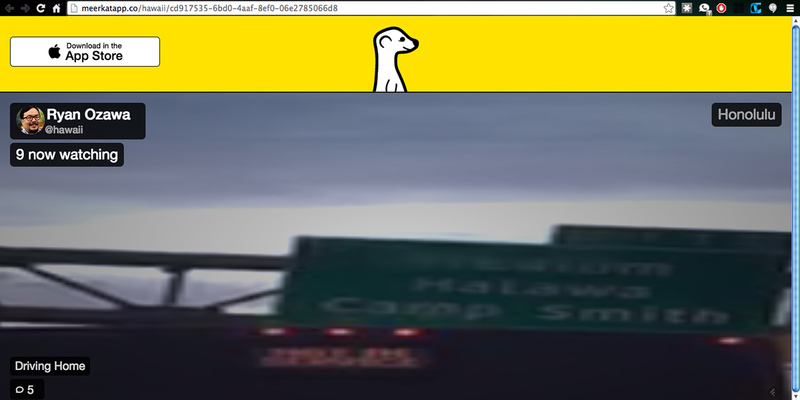 Right now, Meerkat doesn’t archive the video streams online, but this can easily be a feature as much as a bug. After all, like Snapchat Stories and other “ephemeral media,” knowing that your content isn’t forever is also liberating. 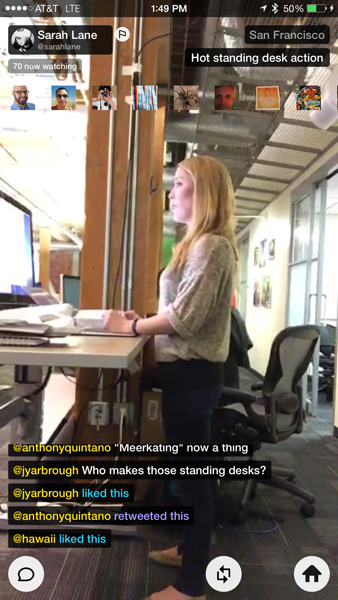 People are launching Meerkat livestreams on a whim, sometimes for just a few seconds, offering a glimpse of live real life. Fortunately, you can save your broadcasts to your smartphone, just in case you do happen to capture a one-in-a-million moment. I decided to save my own first livestream, perhaps fittingly another long drive. The other thing that’s going to take getting used to, obviously, is the app’s default preference for vertical video. Now, I’m starting to soften my stance (Say no to vertical videos! ), and in fact, Meerkat does let you rotate your smartphone to broadcast in landscape orientation. Thank goodness for small miracles. I’m told it was a very pretty sky, at least. And apart from this quirk (and a misstep with its Twitter settings), I’m sold on Meerkat. You can check out the Meerkat website, but it’s basically a link to the Meerkat app in the iTunes App Store. Justin.TV photo courtesy Owen Byrne. Desktop screenshot courtesy @macpro. When I’ve done livestreaming before while driving I notice I’ve an excellent driver. I stop before all line markings at intersections, I come to full stops, I don’t tailgate, I don’t speed, etc. I don’t like to leave any evidence of traffic infractions, not that I do any. I thought one of the best streaming apps was Qik on a jailbroken iPhone. It allowed to live stream, had perfect video/audio sync, could transmit moving location tracking data, provided text chatting/live comments and used litte bandwidth. Then they went legit, Apple wouldn’t let them use the video hooks in the app so video quality was lousy, then Skype bought them and Microsoft bought that and it totally went down the tubes.